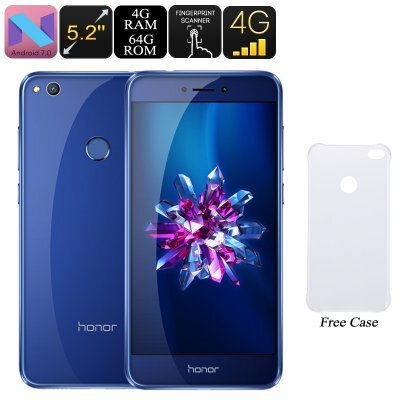 Successfully Added Huawei Honor 8 Android Phone - Android 7.0, Dual-IMEI, Octa-Core CPU, 4GB RAM, 3D Fingerprint, 1080p Display, 12MP Dual-Camera to your Shopping Cart. With its stylish body, beautiful 1080p Full-HD display, and sophisticated specs, the Huawei Honor 8 is an Android phone that both looks good and brings along a great performance. Its high-end metal body makes the phone tough and durable, allowing you to use it throughout the day without needing to worry about scratching your device. Its stylish body furthermore features a deep blue color, making it a true eye-catcher and setting it apart from similar smartphones on the market. Running on an Android 7.0 operating system, this mobile phone is guaranteed to deliver a smooth user experience that comes packed with the latest software features. Whether you use it for work or entertainment, this Android 7.0 Smartphone is guaranteed to meet your demands. Packed within its sleek body you’ll find the powerful Kirin 655 CPU. This Octa-Core CPU has been clocked at 2.3 GHz, allowing it to tackle graphically demanding games, FHD videos and the latest Applications alike. Further increasing your overall media experience is the phone’s Mali T830 GPU that brings along great graphics whenever you engage in your favorite mobile entertainment. With 4GB of RAM, you’ll be able to enjoy a fast performance and multitask throughout the day without needing to worry about slowing down your device. 64GB of internal memory and a 128GB SD card slot ensure that you’ll never run out of storage to save all your files. Featuring two IMEI numbers, this Android smartphone allows you to be connected to two network providers simultaneously. From now on, you’ll always be able to stay connected to all your friends, family, and colleagues no matter where you’re at. Additionally, its 4G support lets you browse the web at lightning speeds. Browse the web, stream online movies, and download applications in the blink of an eye – with this mobile phone at hand, a laggy internet connection will be an issue of the past. Coming with a stunning 12MP Dual-Camera, the Huawei Honor 8 makes professional-grade smartphone photography affordable. Shoot breathtaking pictures and capture 1080p video at any given moment – with this camera at hand, you can be assured that never again a special moment in life passes by uncaptured. Its beautiful 5.2-Inch Full-HD Display allows you to watch back all your photographs and recordings instantly. Additionally, it lets you enjoy all your favorite media in vivid color and stunning detail – bringing along an absolutely mesmerizing mobile visual experience. The Huawei Honor 8 comes with a 12 months warranty, brought to you by the leader in electronic devices as well as wholesale electronic gadgets..